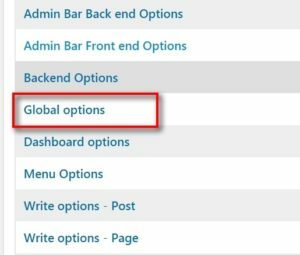 Thinking about how can you disable the screen options button in WordPress? If you are a beginner and not sure about this option, this option gives you the ability to show/hide certain elements on pages within your WordPress admin area. In this article, we will show you how to disable the screen options button in WordPress. 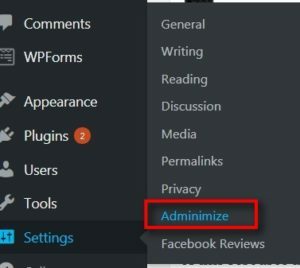 This option will be available throughout the WordPress admin area of your website. It is located at the top right corner of a page. When you click the option, it displays you a set of checkboxes that you may wish to show or hide. It contains options to enable/disable such as Tags, Categories, Author, Slug, Comments, Custom Fields, Excerpts etc. Each user logged in to the admin panel can see this option. The screen option is very important and useful so it might not fall into the wrong hands. Why Disable the Screen Options Button? As mentioned before you can hide/show the elements on the admin area using the screen options and whoever enters into the admin panel can see the screen options button. 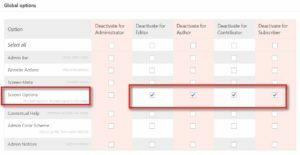 For instance, if you are running a multi-author blog and there are chances that the author may accidentally uncheck an option which would be important and you don’t want to happen. In order to avoid that situation, you can disable the screen options so that you will be able to access the control of the admin view for each user and can control what they can click and change. You can disable the screen options by two methods: Manually and by using plugins. One of the easiest methods of disabling the screen options button is by using the plugin Adminimize. This plugin is very easy to use and disable the screen options button within few clicks. Step 4: By clicking the link, it will lead you the specific tab option. Here you will be able to see a pack of choices to show/hide elements in your admin panel. You can tick the options besides the “Screen Option” leaving the Deactivate for administrator box empty. You can even choose the option as per your wish using the plugin. Finally, click the “Update options” button to save your changes. That’s it you can now move to the admin panel and check that the screen options button will be disabled. In order to manually disable the screen options button, you have to add codes to your WordPress files. You have to add the following lines of code in your WordPress themes functions.php file. Add the code and save it. That’s it, it will automatically remove the screen options button from all the users expect administrator. You can now log in to any user account and you will be able to see that the option is disabled. Both the methods are very easy even for the beginners. Hope you understood how to disable the screen options button in WordPress. If you have any queries or suggestions, please feel free to comment to us. You can subscribe to us at Facebook and Twitter.